A super easy, quick, and delicious low-carb, keto, grain-free, & gluten-free coconut flour pizza crust! This fun keto pizza dough recipe will be a new favorite in no time! Yum, yum! This delicious low-carb keto coconut flour pizza crust turned out delightfully well if I must say so myself! The texture & flavor are absolutely superb...making it great on its own or with a plethora of toppings. This gluten-free coconut flour pizza is also high in fiber & protein, and quick to throw together! This crust will become your delicious new favorite in no time. Enjoy. xo. Low Carb and Keto Friendly. Delicious with a satisfying texture. 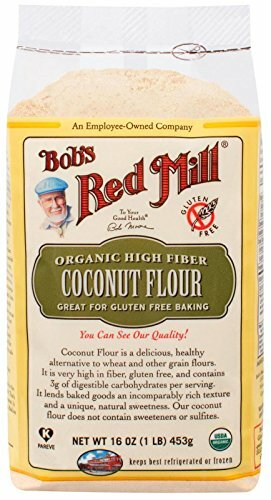 Due to the unique nature of coconut flour, I do not recommend replacing even a fraction of it with another flour. This is a flexible recipe. In a pinch you can add 3 eggs instead of 4; and you can replace the parmesan cheese with cheddar cheese or mozzarella cheese for very similar results. You can omit or modify the garlic and spices to suit your tastes. This will be a relatively thin batter, but don’t fret, it will turn out beautifully once baked. If you are uncomfortable spreading it, or having difficulty, simply pour the batter into cake pans and bake. 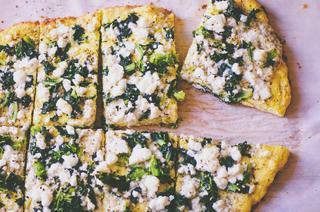 This recipe can be a great flatbread all on its own without toppings. Store in an airtight container in the refrigerator for up to 5 days. Reheat in a 375 F oven until warmed throughout. A super easy, quick, and delicious gluten-free coconut flour pizza crust! High in fiber and protein - it makes a great lunch or dinner! Preheat oven to 400°F.Mix all of the above ingredients, let sit for 5 minutes.Using a spatula, spread & shape batter onto a greased parchment paper lined cookie sheet (approx. 1/2" thick).Bake for 12 minutes. Remove.Apply desired toppings. *Return to oven & bake for 10 minutes, followed by a few minutes under broiler until bubbly.Let stand a few minutes before cutting & serving.Enjoy! *Toppings as shown in images: Follow Your Heart's Pesto Vegenaise, chopped steamed kale, goat's milk feta & coarsely ground black pepper.